JOHN LOCKE IS BACK: Most readers of this newsletter know that when Thomas Jefferson died (on July 4, 1826), he left his family with a huge debt: more than $107,000. That forced his heirs—his daughter Martha Randolph and her son Thomas Jefferson Randolph—to sell virtually all of Monticello’s furniture and furnishings (as well as his enslaved people)—and eventually Monticello itself. That sad state of affairs is an integral part of Saving Monticello and I cover it in detail in the book. As I wrote, the Randolphs held a sale on the mountain on January 15, 1827, that lasted five days. There is no complete record of who bought the items, but family letters reveal that Jefferson’s grandchildren purchased most of the furniture and furnishings. Jefferson’s art works (including sixty-three paintings) and books were not part of the January 1827 auction. The family decided to market the paintings and other works of art in Boston, where they thought the collection would bring better prices than in Charlottesville. They held a sale at the Boston Athenaeum in July 1828 with disappointing results. A second sale took place five years later, on July 19, 1833. It was an auction at Harding’s Gallery in Boston. Again, the results were disappointing; only a few paintings were sold. Sometime after 1833, the Locke portrait made its way to Harvard University. In 1959, Harvard donated the painting was given to the Thomas Jefferson Foundation and it was restored to its place in the Parlor. Flash forward to a few years ago. 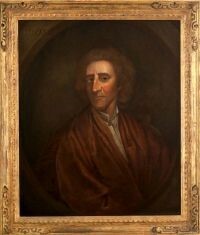 A group of visitors touring Monticello noticed that the Locke painting was in not-great condition. Inquiries were made. The visitors then generously decided to donate the funds to have it conserved. To do the work, Monticello hired Scott Nolley, who runs Fine Art Conservation of Virginia. In a short, but fascinating video, Nolley, Monticello Assistant Curator Emilie Johnson, and Monticello Museum Technician Caitlin Hepner explain the complex process of getting the painting back to its original 18th century condition. It involved a “reversal,” and much in-repainting and retouching. GIFT IDEAS: Want a personally autographed, brand-new paperback copy of Saving Monticello? Please e-mail me at marcleepson@gmail.com I also have a few as-new, unopened hardcover copies. Or go to marcleepson.com/signedbooks.html to order copies through my local bookstore, Second Chapter Books in Middleburg, Virginia. We also have copies of Desperate Engagement, Flag, and What So Proudly We Hailed, and Ballad of the Green Beret.